It seems the sweet-and-salty dessert trend is here to stay, and I am A-okay with that. I’ve certainly dipped my toe in the sweet and salty waters, having sipped many a Starbucks salted-caramel-apple-cider, crunched many a chocolate-covered pretzel, and baked some incredible extra dark brownies with lime and sea salt at home. 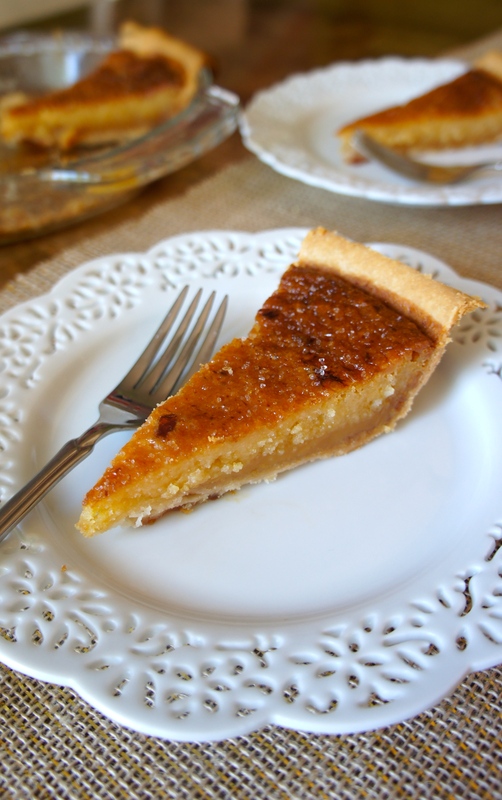 But this recipe for salted honey pie may take the cake–er, you know, pie. It was the hit of our Beatles Singalong Party this weekend (soon to be blogged!). The inspiration for making it was of course the Beatles song “Honey Pie.” It was one dessert I didn’t even have to stretch to contrive from Beatles song lyrics (unlike the “Baby You Can Drive My Caramel Brownies” also included on the menu). And wow, am I glad I gave it a try. One guest described it as “if creme brûlée and pie had a baby.” Which can only mean good things. As I was savoring the combination of the velvety honey custard filling, the sticky caramelized top, and the finish of sea salt crystals, I got to pondering this counter-intuitive food mystery: why should sweet and salty go together in desserts? And why does the combination work better with certain ingredients than others? (I’ve never seen anyone offering up Salted Strawberry Shortcake recipes, for example. And if I ever do, I will report that person to the Food Police.) Also, where did this food trend come from? As far as I recall, it seems to have popped up in the early 2000’s. I decided to do a little research. It turns out there are two primary reasons salt enhances flavor, especially sweetness. One, salt acts in food to reduce water activity, which allows scent molecules to release into the air more easily. Since aroma is such an integral part of the human taste experience, salt’s enhancement of the sweet aroma allows us to enjoy that sweetness even more than usual. Second, a salty flavor has been shown to decrease bitterness in foods (some people even like to put salt in bad coffee for this reason). Once any bitterness is pushed out of the way, the tongue can perceive sweetness all the better. As for where the recent sweet-plus-salty desserts trend comes from, this interesting article explores the answer. One interviewee, a San Francisco confectioner, suggests that the rise of artisanal food products in the early 2000s included artisanal salts. Chefs became interested in where and how to use new products like Himalayan red salt, fleur de sel, and Hawaiian pink salt, and ended up trying them in desserts. But really, who knows? I especially like this quote from Will Goldfarb, owner/chef at Room 4 Dessert in New York: “Everyone in the world likes sweet, salty, and fatty. It’s difficult to credit something everyone loves.” That’s a good enough explanation for me. Especially when it comes to Salted Honey Pie. 3. In a large bowl, combine melted butter, sugar, cornmeal, and salt to form a thick paste. Add honey, vanilla, and vinegar and stir to combine. Blend in eggs and cream until fully incorporated. Pour entire mixture into pie shell. 4. Cover pie edges with aluminum foil and bake in the preheated oven 45-60 minutes until filling top is a caramel brown. 5. Once cooled at least one hour, sprinkle the top with sea salt. Um yum! I love the salty sweet combination and am pinning this recipe to make. I would have never thought to add cornmeal, how is the texture? Can you use Himalayan salt instead of sea salt? Thanks for sharing! 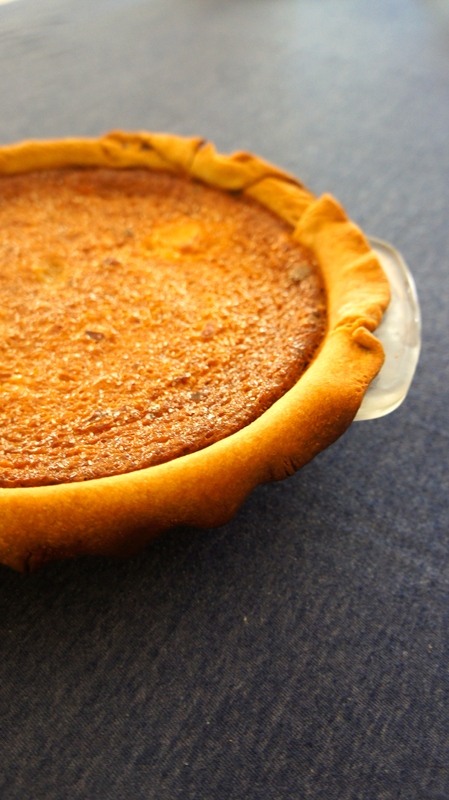 Hi Charissa, the texture is thick and smooth–I never would have known there was cornmeal in it if I hadn’t made it myself! I’m not sure about the Himalayan salt, as I’ve never used it, but as long as it’s a coarse-grained salt, I don’t think you could go wrong. Thanks for reading!